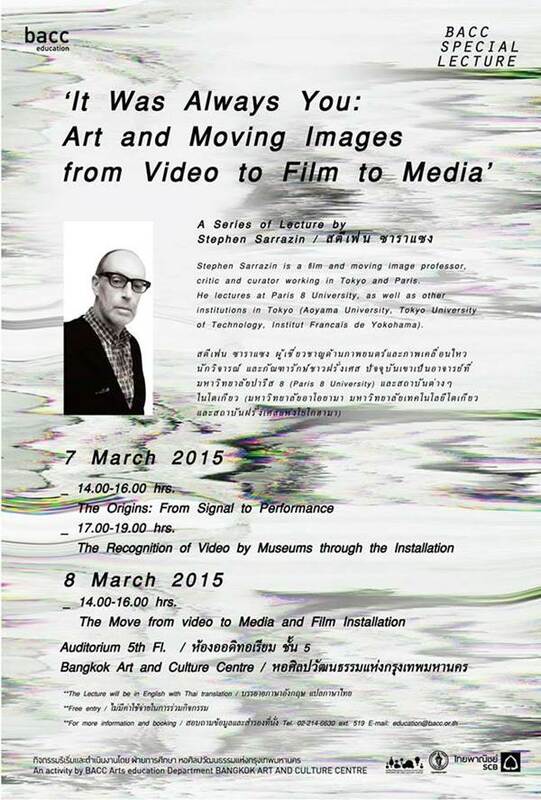 Bangkok Art and Culture Centre proudly presents a special talk “It Was Always You: Art and Moving Images From Video to Film to Media” by Mr. Stephen Sarrazin, a French film and media art lecturer; critic, writer and curator. The talk will give the audience background information and history of video art in order to better understand the concept and the progression of video art from the beginning until now as well as recognise its role as one of the important art forms. Saturday 7 March 2015 14.00hrs.-16.00hrs. Saturday 7 March 2015 17.00hrs.-19.00hrs. Sunday 8 March 2015 14.00hrs.-16.00hrs.